Pete is most well know for his unique skiing and snowboarding paintings and ski prints from around the world full of life, colour and texture. Living near the coast his ocean sunset paintings are also very popular, full of colour, texture and Life. 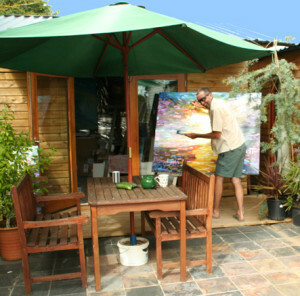 His studio is close to the famous Saunton Sands beach where he likes to surf when he is not snowboarding and skiing. For each genre of paintings for sale select a link below. Many of the paintings are available as affordable Prints. Pete uses bold, pure colours and textures to fill the paintings with a sense of joy and light. Combinations of bright colours in their pure form create vibrant memorable images which will the room with beauty and light. Pinks, turquoises, blues and yellows work together to construct an impression of the scene which captures not just the visual, but much of the joy, energy and feelings to captivate the onlooker. Pete is becoming a popular choice for collectors of art and paintings around the world. Don’t miss out. Follow & Like Pete on facebook – See glimpses of Pete’s new exhibitions and paintings on Pete’s blog, Facebook, Twitter. NEXT DAY SHIPPING INCLUDED. We ship all paintings by 24hr next day delivery within UK included in the price, fully insured and tracked, with a helpful returns policy. For mainland Europe we ship up to 70 x 50cm paintings included in the price on a 3 -5 day service (24hr where possible). For larger paintings to Europe there may be a small surcharge depending on the country. For USA shipping we now have a very reasonable shipping service for most sizes of paintings.